Did you know that flowering plants can remember changes in their environment? I sure didn’t! Flowering plants use their memory to remember the temperature of a cold winter. By doing so, plants ensure that they will only flower during the warmer temperatures of spring or summer. The way plants do this is through a group of proteins called polycomb repressive complex 2 (PRC2). In cold temperatures, the proteins come together as a complex and switch the plant into flowering mode. However little is known about how PRC2 senses the temperature changes in the environment. But according to an article on Science News, a team of researchers from the Universities of Birmingham and Nottingham lead by Dr. Daniel Gibbs discovered a mechanism in angiosperms that enable them to sense and remember changes in the environment so they can adapt to the varying conditions around them, especially during the changing of seasons. The researchers discovered that the protein Vernalization 2 (VRN2), the core of the PRC2, is very unstable. By sensing and remembering the changes in their environment, plants can control their life cycle. I find it so interesting that plants have this capability. Plants that are able to adapt to our world’s ever-changing climate will be more successful in surviving. Researchers from the University of Washington’s Institute of Protein Design have created a new method to engineer protein dimers, or pairs. Working alongside molecular biologists at Ohio State, the researchers have made it possible “to design proteins so they come together exactly how you want them to,” as the paper’s lead author explains. Two proteins held together by DNA. Before, researchers relied on DNA to engineer dimeric proteins, utilizing complementary strands to create helical proteins held together by the hydrogen bonds between base pairs. However, DNA-created proteins lack the functionality of highly active proteins like protease, while also being prone to interference during synthesis. So, longing to create these more complex protein assemblies, the researchers engineered a new way to make them. 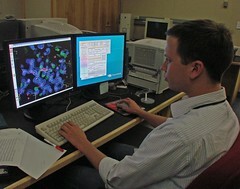 Using a computer program called Rosetta, the researchers designed hydrogen bond networks for their desired protein complexes, creating complementary bond networks for each pair of amino acids. For this, Rosetta algorithmically determined the ideal shape of each amino acid chain, calculating the best way to balance out intermolecular forces and finding the resulting lowest energy level, the most probable state for each chain. Thus, the researchers could accurately design complementary protein structures, so the two parts would fit together exactly. As a result, the researchers were able to create highly specific, more active protein dimers that form double helices unencumbered by DNA and do not form unwanted shapes or interfere with other proteins during synthesis. This new method has the potential to “transform biomedical technology”, as scientists can now have much more control over protein interactions, potentially engineering bacteria to produce energy or designing protein machines to diagnose diseases, among many other tasks. As the researchers set their sights on more complicated, dynamic protein complexes, there is no telling what exciting discoveries await. As we enter the heart of winter, puffy coats, hats, and gloves make it out of our closets to protect us from the frigid air. 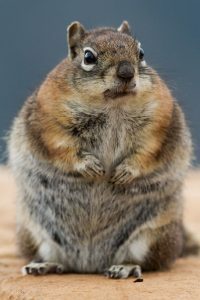 While we trudge along shivering, the ground squirrel lives happily in the cold weather, resistant to the low temperatures. A new study shows that when the ground squirrel wakes from hibernation, it is less sensitive to the cold than its non-hibernating relatives. Why? A cold-sensing protein, TRPM8, in the sensory nerve cells is partly responsible for the amazing phenomenon. In an experiment conducted with mice (non-hibernating), ground squirrels, and Syrian hamsters (hibernating animals closely related to the ground squirrel), the animals were given the choice between a hotter plate and a colder plate. Whereas the mice gravitated toward the hot plate, the ground squirrel and Syrian hamster did not react to the cold temperature of the plate until it dropped below 10 degrees Celsius. Part of the squirrel’s and hamster’s intolerance to cold has to do with the TRPM8 protein. TRPM8 is a cold-sensing protein that sends a signal to the brain when something is too cold. Researchers turned to the gene responsible for turning on the TRPM8 protein to find the differences between a ground squirrel and a rat. They found a chain of six amino acids in the squirrel gene that caused the adaptation to cold. When they switched that section with one from a rat, the squirrel was more sensitive to the cold. It is quite amazing that scientists can extract and switch such small portions of DNA to find the exact cause of a trait. What else do you think this technology could be used for? Tolerance to cold may help the squirrel and hamster transition from an awake state to hibernation state. This is true because if an animal senses or feels cold, it will expend a lot of energy trying to warm itself up. This process counters they physiological changes needed to transition into hibernation, a state of low metabolic activity. Hence, since the hamster and squirrel don’t sense the cold, it will be easier to hibernate. There is still a lot unknown about the TRPM8 protein and ground squirrel temperature sensitivities. It is believed that TRPM8 is only a part of their intolerance to cold. Furthermore, the structure and function of TRPM8 is still being studied and could lead to more breakthroughs. Want to learn more about ground squirrels, hibernation, or the TRPM8 protein? Click here to read the full article! 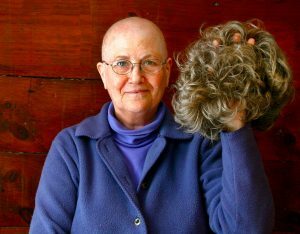 Scientists have been finding a way to prevent hair loss after the painful process of cancer treatment, Chemotherapy (Chemo). Hair loss is one of the biggest feared side-effects. A recent study showed that 75% of female patients who had breast cancer feared the side effect of losing hair. Hair loss scored the highest in a Swedish nurse’s study that investigated the quality of life in patients who had breast cancer. With the help of Sung-Jan Lin, a scientist at National Taiwan University, a protein was made that could withstand the distressing effects of Chemotherapy. There are a few other options for people receiving this treatment. Some will try to put on scalp-cooling caps to freeze the chemo drugs from entering the hair follicles. However, this process is expensive and only works for 50% of the people. The treatment could end up being longer than expected, and can cause mild to severe headaches and discomfort. Lin describes that part of the problem is that we have such a limited knowledge of how Chemotherapy damages hair follicles. 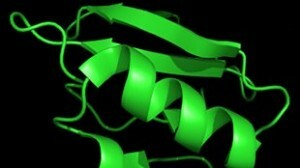 Studying P53, Lin found out that the protein was blocking a hair-promoting protein WNT3A. This stimulated his team to ask the following question. Is injecting WNT3A directly into the scalp while administering Chemo prevent hair loss? The team decided to experiment with mice with a chemotherapy agent, and soon enough the results matched their hypothesis. One group of mice were injected with WNT3A soaked beads. And sure enough, that group sustained their hair. While the other group that was not given WNT3A loss all their hair. Lin and his team are now working to adapt his studies on human patients. As stated by Lin it would be unsafe to inject WNT3A in bead form. As a result, they are working to create the protein in a gel or cream solution. With this new hair saving option, the cancer treatment will seem less fearful for some patients. This treatment could be a big help for the future. Scientists are working to expand their knowledge on how to effectively provide treatment without endangering our human traits. So after hearing all this, what do you feel about this new idea? Will the “power of proteins” eliminate other side effects provided by Chemotherapy? If so, what kinds? Let me know in the comments below. All eukaryotic cells consist of compartmentalized organelles, each with a specific function. We’ve all heard of mitochondria, chloroplast, and lysosomes, but, what if we could design a new organelle?! That’s exactly what scientists are working on right now – modifying or hijacking existing organelles to fit new specific functions. Scientists currently have the technology to alter the DNA of cells to manufacture proteins they couldn’t “naturally” make. However, this technique has a few flaws. The proteins produced or their intermediates could damage the cell and chemicals in the cell could damage the proteins. If we could compartmentalize the production of these new proteins, this problem would be avoided. So, we look to organelles! Stuart Warriner, a chemical biologist at the University of Leeds, and his colleagues believe peroxisomes are the key. Current techniques allow scientists to manipulate these organelles. Their experiments show that they could deliver certain proteins into the peroxisomes of most cells. These selective proteins are ones that are not usually made; therefore, we say that humans have “hijacked” the cell. Scientists are hopeful that future research could lead to the ability to use peroxisomes to manufacture compounds by importing specific proteins into them. Currently, when an organelle is modified, every organelle of that type must be modified. Future research could ensure that modified and conventional organelles could coexist in the same cell. In addition, Warriner and his team are working on the modification of peroxisomes in yeast to produce desirable compounds. Despite these studies, Warriner believes that this technique of hijacking organelles will not be implemented in humans for decades, if not never, because it wouldn’t be particularly useful. To learn more, check out their findings! We have the ability to alter DNA and cells! That is amazing! Although peroxisome altercation may not prove to be essential to humans, it is still an impressive exploratory feat and a step toward greater modification in microscopic organisms. What do you think similar cell modification research should be focused on? Protein: A Cell’s Hero or Villain? The function of the endoplasmic reticulum is to fold and secret transmembrane proteins. Proteins in cells provide a variety of functions; such as speeding up chemical reactions through enzymes, protecting the cell against disease through antibodies, and coordinating organism activities with hormones. Proteins are obviously crucial to cells. However, recent research shows that although proteins are supposed to help cells run efficiently, in some cases, under stress, proteins can cause cell suicide, or apoptosis. Apoptosis is part of the natural cycle of a cell, but in this case, proteins are truncating the cell’s normal cycle, which can even be disease-inducing. When environmental conditions or genetic factors around the ER go awry, a cellular stress reaction called the Unfolded Protein Response (UPR) either triggers or deactivates DR5, Death Receptor 5 Protein, which can lead to cell suicide. The two main factors which control the UPR are IRE1A and PERK. By activating XBP1, which drives expression of cell-survival genes, IRE1A promotes cell survival. PERK actives CHOP, which in turn activates DR5. The ER activates UPR in order to alleviate cell stress and return the ER to homeostasis, but this instead can lead to apoptosis. ER stress is central to many diseases, including neurodegeneration, type II diabetes, cancer, atherosclerosis, and liver disease. This finding is so important because now that scientists have found that IRE1A and PERK are the causes of this response, they can better study the phenomenon. The idea that an organelle can be stressed is very interesting. I usually think of organelles as having clean structures and clean results, but this story shows that the ER can be overstressed through changing conditions and its actions will reflect this stress. Another interesting part of this article is that when the ER activates UPR, this will either activate or deactivate the DR5, the cause of cell suicide. In science, we usually think of things as reliable and consistent, but this response to the ER can either save the kill or destroy the cell. Finally, Cancer is a diseased caused by the over-multiplication of cells. If cell stress leads to cell suicide, then maybe scientists can use their new found understanding of the proteins involved in UPR to figure out a way to destroy cancerous cells. A group of researchers from MIT recently published their groundbreaking findings on specially engineered proteins that are able to stick to substances both in and out of water. Using naturally occurring adhesives secreted by mussels as a model for their research, the team combined those proteins with biofilms from certain bacteria to create an especially strong and sticky hybrid. These new adhesives are much more complex than previously engineered proteins. While other scientists used the E. coli bacteria as a template to engineer proteins that resembled the mussel’s protein, leading researcher Timothy Lu described those methods as unable to “capture the complexity of the natural adhesives”. Therefore, the MIT research team uses several types of bacteria to separately manufacture components of different mussel proteins and then combines them with bacterial curli fibers into one complex adhesive. There are numerous applications of this discovery. Once the team is able to concoct a method of generating the protein in great quantities, it can be used to repair holes in ships as well as to seal wounds after an accident or surgery. One of the team’s subsequent goals is to create “living glues” composed of bacteria that would react to a breach of a material and repair it through secretion of a protein adhesive. The potential of this discovery is demonstrated by the acclaim of the group’s sponsors, which include The Office of Naval Research, the National Science Foundation, and the National Institutes of Health. Scientists at MIT have created their own adhesive that could revolutionize multiple aspects of life. This adhesive would be used for patching up multiple things ranging from ships to human wounds. The adhesive is made from the proteins found in mussels and the proteins in biofilms. The way mussels stick to ships is because the proteins act as a natural adhesive/glue like material. 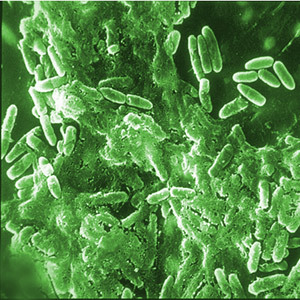 Biofilm is a group of organisms that stick to each other and other surfaces. Separate, these both have strong attaching abilities, but when combined, the MIT scientists created the “strongest biologically inspired, protein-based underwater adhesives reported to date”. 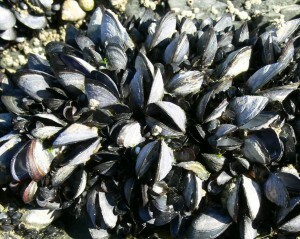 The new adhesive was created by using the foot proteins in the mussels. More specifically, they used the curli fibers which attach and form larger and stronger fibers, called fibrous meshes. The fibrous meshes can be used both in dry and aqueous solutions making it very versatile. Timothy Lu, the associate professor of biological engineering and electrical engineering and computer science at MIT, is in charge of the research. Although the adhesive is produced in small amounts, Lu has high hopes as he has plans to make a “living glue” that can tell when there is an opening and secrete the adhesive by itself. This could be very useful if the adhesive is used for human treatment because the adhesive would know exactly when to activate and deactivate itself. Do you think that this adhesive can make an impact on society? older, hearing loss effects all ages, as thirty school children per out one-thousand are afflicted in some varying degree. An individual is able to hear sound involving the ear’s main structures. In age-related hearing loss, one or more of these structures is damaged: the external ear canal, the middle ear, and the inner ear. External ear canal impairment is related exclusively to conducive hearing loss. The middle ear, which is separated from the ear canal by the eardrum may be caused by sensorineural hearing loss. Lastly, the inner ear, which contains the cochlea, the main sensory organ of hearing. When the vibrations from the middle ear enter the cochlea it causes the fluid to move and the sensory hair cells pick up this movement. In response to the movement of the fluid the hair cells send an electrical signal up the auditory nerve to the brain where it’s recognized as sound. Now, how do these different internal departments of the human ear gradually induce hearing loss? While we get older, some may develop presbycusis, which causes the tiny hair-like cells in the cochlea to deteriorate over time. Clarity of sound decreases, as the hairs are unable to vibrate as effectively in response to sound. Recently, otolaryngologists have discovered new evidence that human hearing loss relates to a certain genetic mutations. A study at the University of Melbourne revealed “a novel genetic mutation was first identified in 2010 as causing hearing loss in humans… now discovered that this mutation induces malfunction of an inhibitor of an enzyme commonly found in our body that destroys proteins – known scientifically as SERPINB6. Individuals who lacked both copies of this “good gene” were shown to have lost their hearing by twenty years of age. Although this discovery is changing the way scientists previously viewed hearing loss, the answer to why this mutation, SERPINB6, is a catalysts for such loss, is inconclusive. However, this mutative gene has created a revelation for many: it is now not unusual to show gradual signs of hearing loss under the age of sixty years. To better understand the effects of the mutant gene, mice were used in order to imitate the condition from youth to adulthood. At only three weeks of age, mice with SERPINB6 had begun to lose hearing – three weeks is equivalent to pubescent or teenage years in humans. And as we could have predicted, the mice continued to show a decrease in hearing ability, much the same as humans. Researchers examined the mice’s inner ear, which revealed the cells responsible for interpreting sound (sensory hair cells) had died. Fortunately, this new discovery of a mutant gene in human sensory cells has created new attention to better understand the case of those who are effected by the condition. Gerbils Can You Hear Me? 80 to 90 percent of people suffer from inherited deafness. In a study, scientists have reversed deafness in gerbils. This is a huge step in gene therapy research this month making the possibility of using gene therapy as a cure for deftness one step closer. Genetic therapy is the use of genetic material such as DNA to manipulate a cell and is generally used to treat inherited diseases; in this case scientists used human embryonic stem cells. The gerbils in the study were born deaf. This type of deafness is a birth defect caused by damage to hair cells in the inner ear. 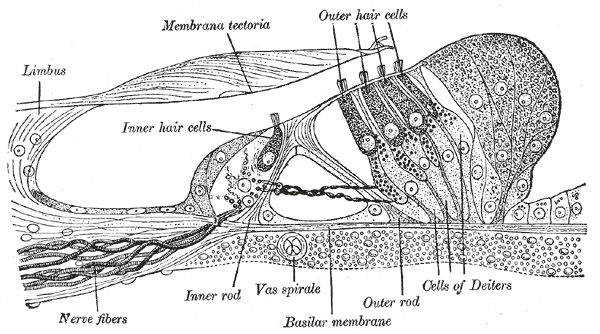 These inner ear hair along with auditory neurons which translate sound vibrations from the inner-ear cells to electrical signals are how you can hear. 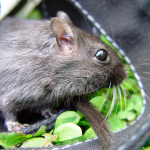 Scientists specifically worked on gerbils whose deafness was caused by a mutation in a gene coding for a protein called vesicular glumamate transporter-3. Even minor alterations to a protein’s primary structure ,such as the movement of a double bond, will cause major defects in the tertiary structure and the function of the protein. The mutated protein in this study vesicular glutamate transporter-3 controls the consumption of glutamate (neurotransmitter) into synaptic vesicles, which join two nerve cells, of the neural cells. This is clearly groundbreaking news this month and has proved the various use of stem cells. How do you feel about the use of embryonic stem cell research? Feel free to comment!! Gamers solve some of biology’s most difficult riddles? Who is solving some of biology’s most difficult puzzles and riddles? Obviously scientists, right? Think again. It’s the gamers. An article recently reported that a revolutionary online game called Foldit, allows anyone, from gamers to students, to help predict the foldings and structures of various proteins by playing competitively online. Protein folding is one of biology’s most difficult and costly problems, and is even a troublesome task for the most capable computers. A game such as Foldit requires much insight and an intuitive understanding to fold the proteins, allowing human intuition to triumph over a computer’s calculations. As we have learned in class, proteins are very prevalent in the human body. Hormones, enzymes, and antibodies are all examples of proteins, but many proteins are also associated with strands of viruses and diseases. This is where you, as the gamers, come into the picture. Since proteins play a large role in the functions of viruses and diseases, gamers playing Foldit can help design new proteins to help treat or provide a cure for the condition. The article reported that gamers have most recently solved the structure of an enzyme crucial for the reproduction of the AIDS virus. 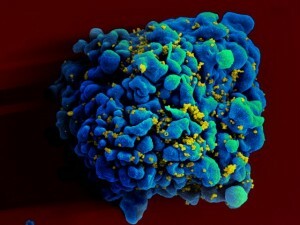 Knowing the structure, scientists are now able to find certain drugs to neutralize the enzyme and stop the reproduction of AIDS virus. In class, we have learned that there is basically an infinite amount of combinations of proteins; there are 20 amino acids and can be combined to form chains of various lengths. We have also learned that the structure of a protein is also correlated with its function. The bonds present in the primary, secondary, tertiary, and quaternary structures of proteins are an important part to the shape and folds of a protein, giving the protein certain properties due to its shape. All of the information we have learned about proteins in our AP Biology class, can be seen and easily applied to the game, Foldit. Now since we know the vital importance of proteins, do you want contribute to the next cure for a virus or disease? Get your game on and try Foldit out and see what you can do to solve some of biology’s most difficult riddles! No, a bionic baby did not come and save today’s world from global warming but in fact, embryonic cells could potentially save those who suffer from Sickle Cell Disease. Sickle Cell Disease occurs as a result of a DNA letter change in the gene for hemoglobin, the main protein that carries oxygen for red blood cells. It is possible for the single mutation in the amino acid sequence to affect the entire protein because, as I learned in class, the chain of amino acids, formed by peptide bonds, constitutes the primary structure of proteins. A recent study conducted by researchers at Johns Hopkins have found that sickle cell disease, a disease that can be very debilitating and affects mostly African Americans, can be cured with the use of stem cells. This is important because the only cure that has been found so far is bone marrow transplants, which can be very painful and is not always successful. The researchers isolated a patient’s own bone marrow cells and used them to generate induced pluripotent stem cells, which are adults cells that can be reprogrammed into embryonic cells. These embryonic cells can then be coaxed into red blood cells, through the use of growth factors. Despite this progress, Dr. Linzhao Cheng states that, “these immature red blood cells still behave like embryonic cells, and as a result are unable to turn on high enough levels of the adult hemoglobin gene” . The cells still need to be coaxed into mature red blood cells. Even if these cells can be coaxed into maturity, can they be used to cure Sickle Cell Disease? 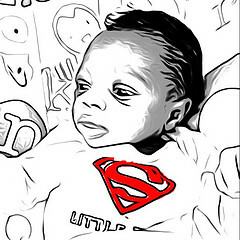 Can babies actually save the day?